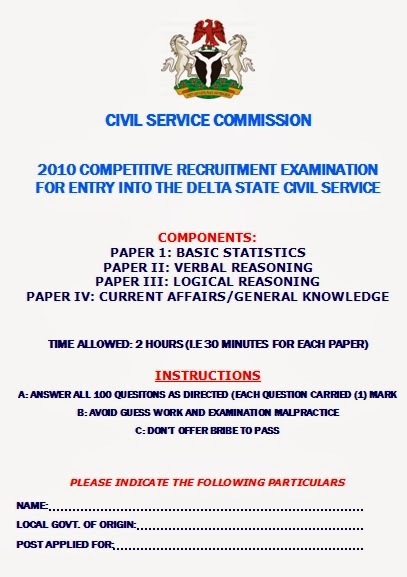 Why wait until the last minutes, to all applicant who are writing the upcoming Civil Service Commission Competitive Recruitment Examination for entry into the Delta State Civil Service. This is the best time you should be preparing for the recruitment exam by solving past question paper. The motive behind this is to enable applicant prepare harder, have experience and also work on TIME which has been a major factor to applicant downfall. Note: It’s not compulsory if you believe in yourself, but i can assure you its very necessary. For those who want it without delay, you can choose to download and print it out instantly. To get the password to open it, after downloading call/whatsapp me on 08051311885. Click here to start download of the full document. You can also reach us on our address below to have a hard copy of it.